Sam has concentrated on modern design and technology for many years, ensuring quality, longevity and the highest practical use of their bathroom products. They have specialised in bathroom mirrors since the 1970s, a cornerstone of the Sam range, drawing attention again and again due to their innovative concepts and fascinating design. 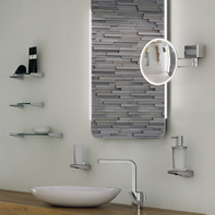 The Kosmetik and Miro ranges of mirrors represent the finest in German quality and functionality.